Pipers Pictures: What makes a good photo become a great photo? What makes a good photo become a great photo? Every photographer will have a different answer to this and for everyone taking or looking at pictures it is something different. Is it the composition? The light? The beautiful subject? Yes, these are all necessary for a great shot, but for me, the wow factor comes from something else, a natural photograph, the one the subject didn't realise was being taken. After a busy day taking photos yesterday one of my favourite pictures was actually after the session when the light was just getting good and was completely natural and unrelated to the actual photo shoot. 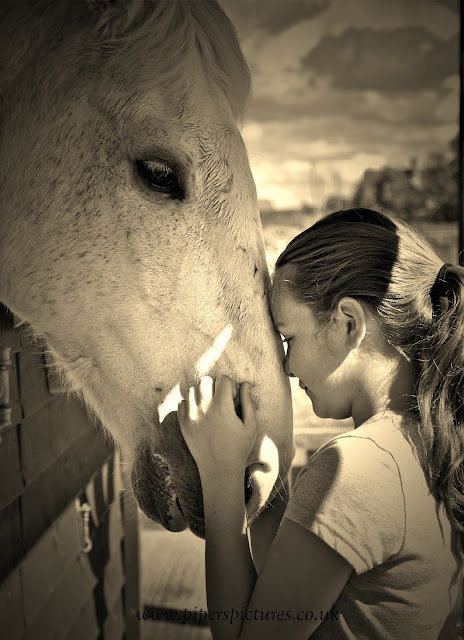 Just a girl and a horse. This has reminded me why that, despite the UK's very unpredictable and often appalling weather, I am perserving with natural, outdoors photography and why I am not working in a white studio. The shots may be harder to achieve but then one comes along that I am just so proud to have taken.